The Amazing Benefits of Assam Tea You Did Not Know About! Assam tea originates from the region of the same name in India, which is the largest tea-growing region in the world. This indigenous tea is grown in the lowlands at the eastern edge of the Himalayas, unlike many other highland black teas. Assam is a black, malty tea with a strong flavor and bright color. Because of its strength and high caffeine content, Assam is ideal for a bold, hearty breakfast tea blend. English and Irish breakfast teas often include Assam tea. In 1823, Scottish gentleman and tea planter Robert Bruce traveled to India and befriended the native people. He noticed the tribesmen brewed tea from the leaves of an unfamiliar tree, and asked for samples. Although Robert died soon after his discovery, his brother Charles eventually sent some Assam tea leaves to the botanical gardens at Calcutta for examination. The leaves were identified as a type of tea, but one different from the Chinese variety (Camellia sinensis var. sinensis). Despite their initial belief in the inferiority of Indian tea versus Chinese, the British found that the Assamese variety of tea withstood the high temperatures in Assam better than Chinese tea. Once the British decided to use the Assam leaves, they set up the Assam Company (the first joint stock tea company). Other companies like George Williamson and Jorehaut Tea Company soon followed. As a direct result of Bruce’s discovery, India would eventually exceed China in worldwide tea production. The Assam region’s tropical temperatures, humidity, and monsoon rainfall create the perfect environment for growing this kind of black tea. Since its discovery, Assam has been planted throughout Asia. The tea has proved easy to grow and harvest frequently. Because of its historical influence on tea production worldwide, as well as its bold flavor and high caffeine content, Assam is an essential part of any beginner’s tea exploration. Does Assam tea have caffeine? Like all black teas, Assam has high levels of caffeine. That’s what makes it a great breakfast tea! However, Assam surpasses both Earl Grey and Ceylon black tea in terms of caffeine; there are 80 mg caffeine per one cup serving of Assam. To put that in perspective, Earl Grey tea contains 65 mg of caffeine per cup, and Ceylon black tea contains only 23 grams per serving. Assam is harvested twice a year, resulting in two distinct Assam tea flushes. Both have the Assam notes of malt, honey, and nuts, but each has a distinctive flavor and texture. The second, “tippy” tea leaf is more highly esteemed than the leaf from the first harvest. Spring Flush – The first harvest of Assam tea occurs sometime between March and mid-May. These tea leaves are more mellow, smooth, and fragrant than their summer counterparts. Summer Flush – Assam’s second harvest takes place starting in mid-May and lasting throughout the summer. Summer flush Assam tea is known as “tippy tea” due to the golden tips on the leaves. This kind of Assam is sweeter, darker, and more full-bodied than the spring flush tea. Summer flush Assam tea is highly prized and considered a superior harvest. Like other black teas, Assam tastes great with milk and spices because its flavor shines through any additives. Assam’s rich, bold taste makes it ideal for making masala chai. It’s also great as a black breakfast tea with milk and sugar or honey. For the best-tasting cup of Assam tea, select whole leaves with golden tips (from the “summer flush” mentioned above). Assam is best enjoyed in the morning. Serve your tea in white teacups to best observe its bright copper color. Make sure to smell your tea’s sultry aroma of autumn spices, nuts, and fruits. The taste should be malty and robust, with a vigorous body. Remember that the spring flush tea will taste sweeter and more floral than the fruity summer flush tea. Brew the leaves whole in a ceramic teapot or an electric, temperature-controlled kettle. Then strain the tea to remove the leaves (or drink it straight, filtering out the leaves with your lips as you sip). This brewing method allows the leaves’ flavor to fully develop during steeping, as opposed to a constraining metal infuser basket. Before boiling any water, fill both the teapot and your cups/mugs about halfway with hot water to pre-heat them. This helps the tea stay hot. Swirl the water around so the water wets the cups all the way around. Then pour out the water. Now you can brew the tea! Assam tea is best brewed using boiling water, as the high temperature helps extract the essence of the dark leaves. Use filtered water for best results. (Rule of thumb–if you don’t want to use filtered water, just make sure you would drink the water before using it to brew tea.) Put 1 teaspoon of tea leaves into the teapot for every 8 oz. of water. Then fill the teapot with boiling (194-205ºF) water; make sure to pour the water right after it leaves the burner. Place the lid on the teapot and let the tea steep for 3-5 minutes (adjust depending on the desired strength of tea). Pour the tea into your cups and enjoy! Alternatively, you can use a traditional Chinese pot called a gaiwan. A gaiwan has a saucer, a bowl that contains 3-5 fluid ounces, and a lid. Basically, you pour hot water into an empty gaiwan for a minute to warm it up. Then you empty out the pot–in the same way recommended for a teapot earlier–and fill the bottom with whole tea leaves. Next, pour in boiling water. Steep for about 20 seconds; the steeping time is so short because you’re making so much tea for a small volume of water. Finally, use the lid as a strainer to pour the tea into a cup. This way, you don’t have to worry about drinking the tea leaves. Assam tea can be brewed twice or even three times. Just remember to strain your tea completely when brewed and increase steeping times for the following brews. Assam tea may be high in caffeine, but its vitamins, minerals, and antioxidants make it a healthy alternative to a cup of coffee in the morning. Like other black teas, Assam is rich in flavonoids, a type of antioxidant. Flavonoids help reduce inflammation and support the cardiovascular and nervous systems. Because flavonoids help detox potentially tissue-damaging molecules, their intake has often been associated with decreased risk of certain types of cancers, including lung and breast cancer. It is important to note that the amount of flavonoids required to produce the above effects has not yet been agreed upon by scientists. Due its extensive oxidization process, Assam contains fewer antioxidants than green or white tea. Adding milk can also reduce the potency of Assam’s health benefits. Still, the list of possible health benefits of Assam tea is long. 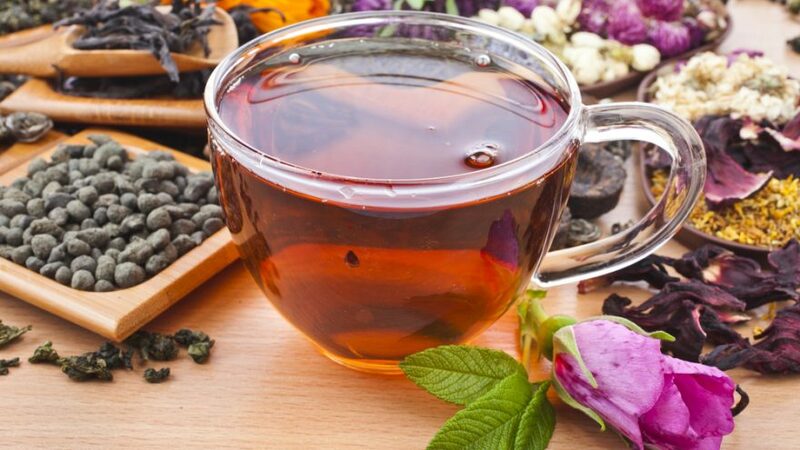 Assam may help decrease the risk of heart attack and stroke, strengthen the immune system, fight free radicals, decrease the risk of brain function disorders like Alzheimer’s disease, fight cavities, and improve blood circulation. While the science is inconclusive, most people do find that drinking Assam tea relieves tension and soothes nerves. While tea is generally good for you, highly caffeinated teas like Assam can have possible side effects. Assam can put drinkers at a low risk of insomnia and osteofluorosis (skeletal changes caused by the chronic intake of excessive quantities of fluorides). Drinking too much Assam tea can also put you at a high risk of anemia, diabetes (when taken with sugar), heart stroke, high blood pressure, and kidney stones. As with all food and beverages, consume Assam in moderation. Assam tea plantations span more than 500,000 acres in the region. Out of the 1207.31 million kgs of tea produced in India in 2014, the state of Assam produced 610.97 million kgs, or about half. While the nickname “tea gardens” conjures images of small tea farms run by local farmers, tea plantations are actually huge, self-contained entities run autonomously, much like mini towns. 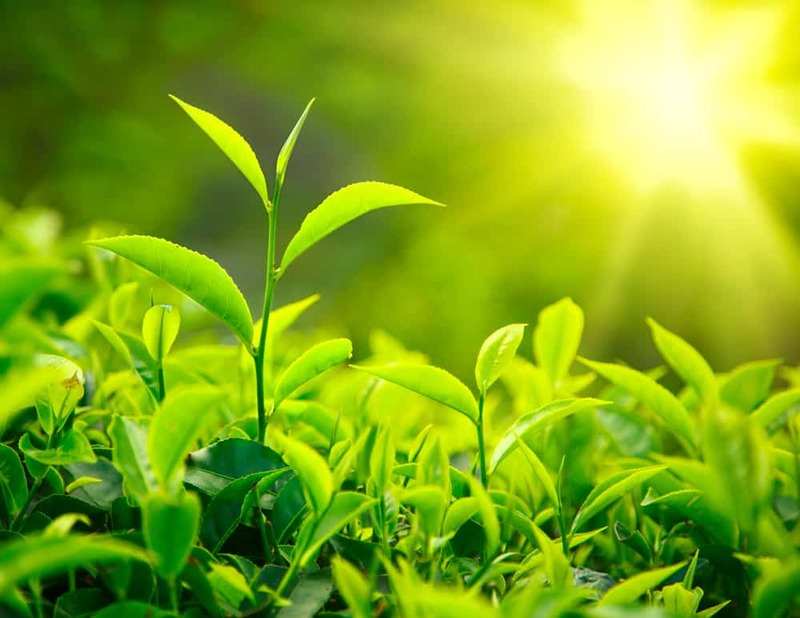 Each tea garden has its own tea growing area, processing factory, management and labor force, forest land, rice fields, housing, power, water supply, and hospital. Similar to coffee growing, every stage of tea processing, from plucking to final shipment, must be diligently monitored. There are five main steps, and each one directly affects the tea’s quality and taste. During the second (summer) flush, the Assam factory runs nonstop. To prevent the tea from losing its flavor, leaves plucked that day have to be made into black tea within 24 hours and sorted into varying grades. Once the green leaves have been picked, they are taken to the factory and immediately spread in a thin layer over Hessian cloth placed over wire-mesh racks. This part of the factory is called the withering shed, and the tea stays here until it loses some of its moisture content. During hot weather, withering takes around 12 hours, so the factory has to start this process at midnight. The next step involves rolling the newly withered leaves in Sirocco machines or putting them through a CTC machine. The CTC stands for the simultaneous crushing, tearing, and curling process that takes place inside the machine. The crushed tea leaves are thinly spread on trays to ferment. This process oxidizes the leaves and lets their juices interact. The fermentation process has to be closely watched because it takes an experienced tea planter to decide how long to ferment the leaves (this can last from an hour to two or more). Assam leaves in particular are oxidized more than green or white tea leaves to make them into black tea. The fermented tea leaves are then taken to the drying machines and spread thinly on trays. The machines blow hot air over the leaves to extract any remaining moisture. Once the drying process is finished, the tea appears black and shriveled, like the leaves you buy at the store. The drying process combined with the CTC and fermenting steps determine the taste of the final product, because the method of firing tea leaves and its duration affects how the tea oxidizes. The finished tea travels to the sorting room next. Thanks to its long history–its discovery in 1823 was a catalyst for India’s rise to the top of the worldwide tea trade–and distinctive taste, Assam tea is an essential part of any beginning tea drinker’s exploration of the beverage. Its strong flavor and high caffeine content make it a great addition to any breakfast, and it can be modified with milk and spices for those with a sweet tooth. Like other black teas, Assam provides many health benefits because of its antioxidant content. However, because of the firing process it goes through, black tea contains fewer antioxidants than green or white tea, which are less processed. Make sure to buy high quality, whole leaf Assam from the second harvest or summer flush. Brew it in a ceramic teapot or a traditional Chinese gaiwan–you won’t be disappointed.